This morning a group of our neighbours from 1251 King, along with members of Parkdale Organize, travelled together from Parkdale to the uptown offices of the landlord, Nuspor Investments. We came to demand Nuspor drop the above guideline rent increase at the building. We also brought a stack of requests for repairs that have gone long neglected in tenants’ units. On a Wednesday morning during business hours we arrived to find the office door locked. Our calls to the Nuspor office phone extensions went unanswered. Rather than hear from their tenants, Nuspor decided to close their office altogether. In the lobby of Nuspor’s office we met and discussed next steps for escalating action against the landlord. 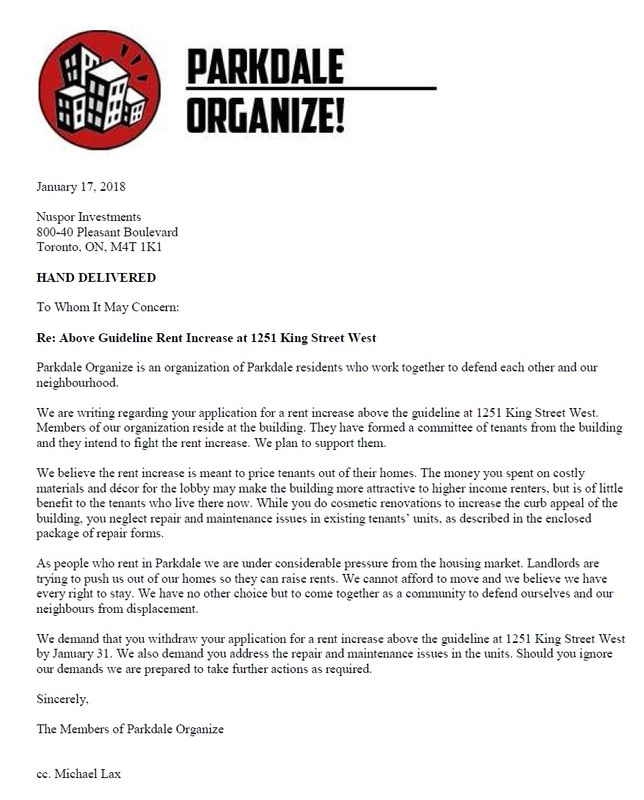 If recent organizing by working class people in Parkdale is any indication, Nuspor will not be able to evade its tenants for long.